Beyond providing data for all 32 NFL teams, PFF also supports network broadcasters with game-preview packets that are used to enhance the in-game experience for fans and viewers. This Eagles-Titans preview features the same information our broadcast partners use for team research and in-game production. 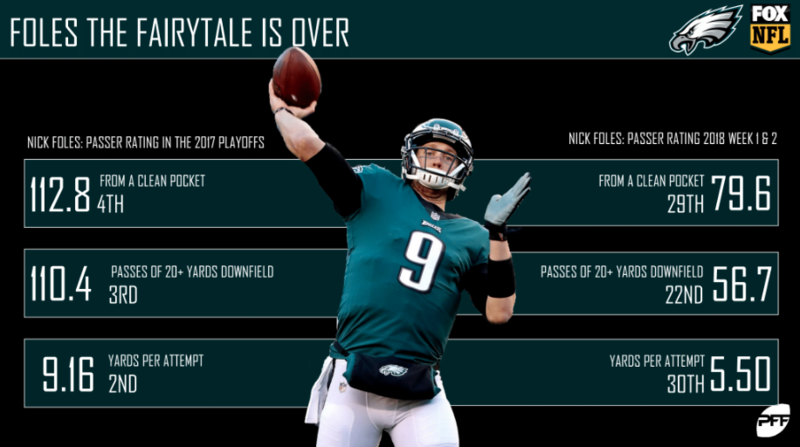 Since leaving Minnesota as the Super Bowl 52 MVP, Nick Foles was almost unrecognizable. Through the first two weeks, Foles boasted a 79.6 passer rating from a clean pocket and averaged just 5.50 yards per pass attempt, both of which ranked among the bottom-five signal-callers. Wentz will hope to return to the same player that finished the 2017 season with a passer rating of 110.3 from a clean pocket. 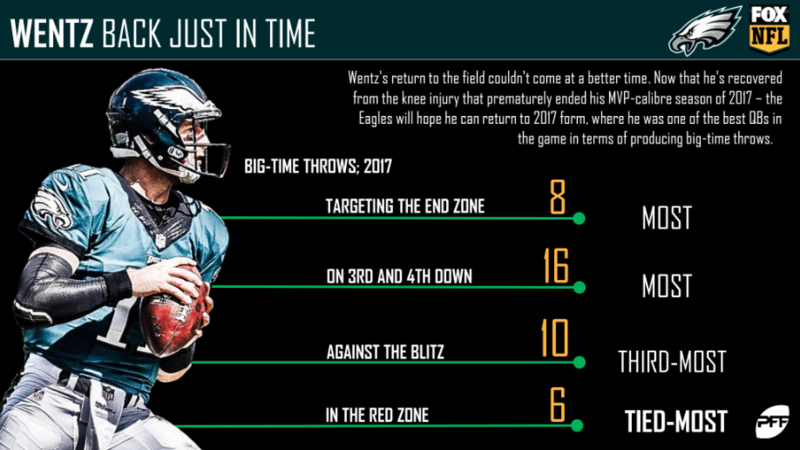 Even though his season was cut short, in 2017, Wentz produced the most big-time throws among quarterbacks in the red zone and on money downs. 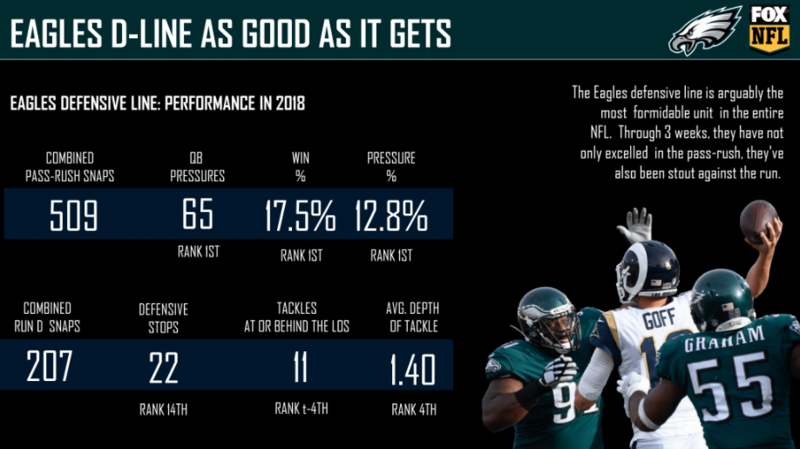 After finishing the 2017 season with a pass rushing grade of 86.7 (1st in the league), the Eagles currently lead the league once again with a pass-rushing grade of 80.6. In particular, Chris Long and Fletcher Cox, who have combined for 32 pressures so far this year, have been unstoppable. After losing Patrick Robinson in free agency to the Saints, many feared the reigning Super Bowl Champion’s secondary would have an obvious Achilles’ heel. 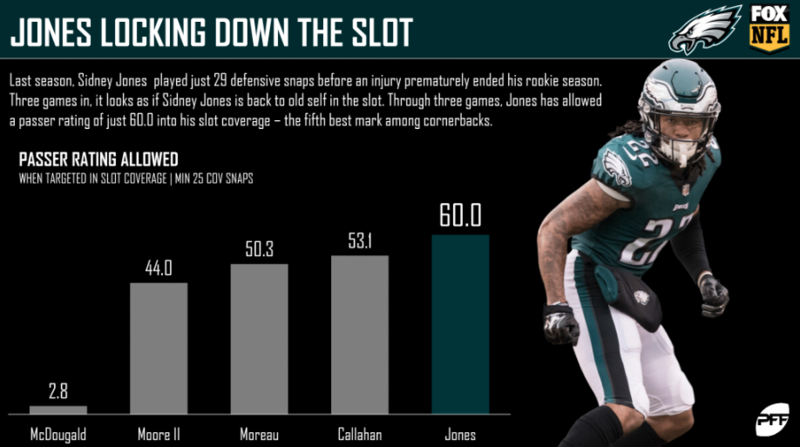 Through 3 games, however, Sidney Jones has been the exact opposite and has allowed a passer rating of just 60.0 on throws into his slot coverage. At the NFL level, most quarterbacks find themselves struggling under pressure. Every rule has an exception, however, and Marcus Mariota is exactly that. 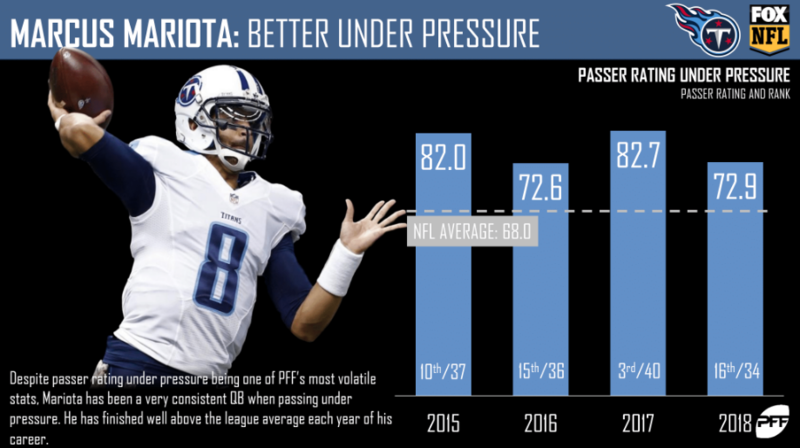 Since entering the league in 2015, Mariota has been an above average quarterback when facing pressure, finishing each season with a passer rating of 72.6 or higher. One of the more intriguing matchups this Sunday will feature a battle of two highly regarded second-year players. 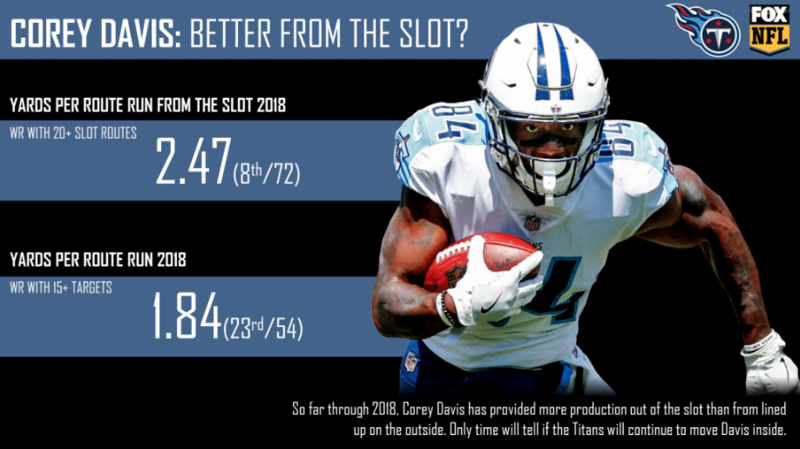 Corey Davis, who has been the NFL’s eighth-best receiver in terms of yards per route ran from the slot, will square off against Sidney Jones, who has been the NFL’s second-best cornerback in terms of yards per slot coverage snap. 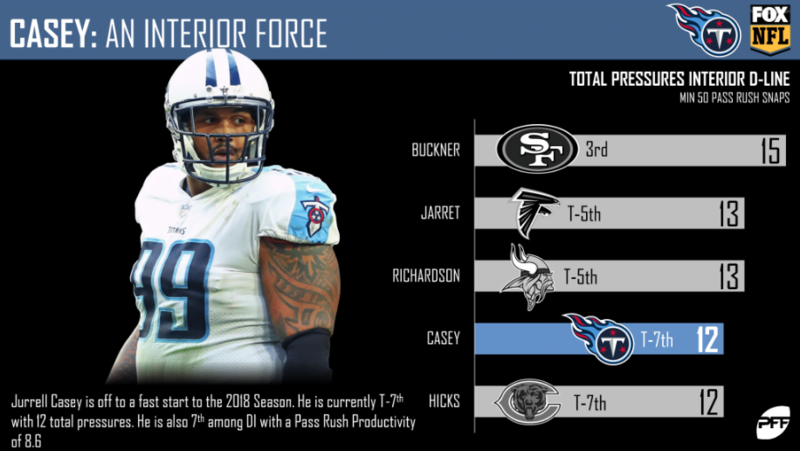 Through three games, Jurrell Casey has been a force from the interior defensive line and has already produced three sacks, one hit, and eight hurries. 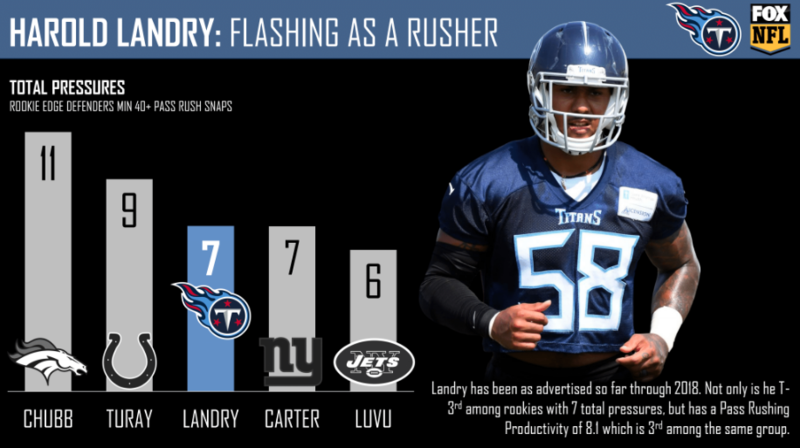 While Casey has been very impressive so far, the best storyline along the defensive line of the Titans has been rookie Harold Landry, who has seven pressures through his first three games, a mark that is tied for third among rookie edge defenders in 2018. To help put this into perspective, Landry has more pressures than Khalil Mack (6), Olivier Vernon (2), or Von Miller (6) had through the first three games of their respective rookie seasons. 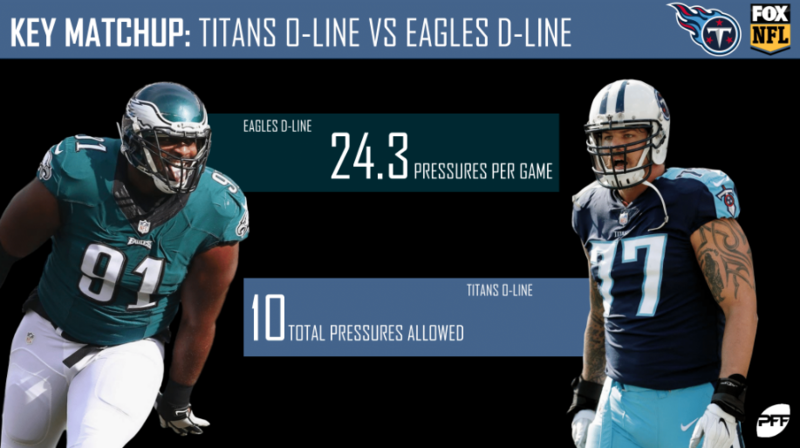 PFF Greenline has projections for the spread, moneyline and over/under of the Philadelphia Eagles’ matchup with the Tennessee Titans. Get its picks here.